If you do try...you may LOVE IT! I bought a group of classes at a yoga studio, and just sat on them. I was nervous. Why, I have no clue. I wouldn't know any one there. I have never taken a yoga class previously so I waited. Then on a whim I booked my first class, and I went. It was amazing!!!! I was still sore yesterday! I sweat (a LOT)!!! I was physically exhausted when the class was over, yet felt physically alert and exhilarated! I pushed myself in a different ways than I regularly do when working out. I am a convert - and I can't wait to go back!!! I have been walking taller, and now I want to see if all the crazy things I used to be able to make my body do - to see if they will return (splits both ways, the foot behind the head...). My teacher was great. The studio was gorgeous. Has anyone else felt a little timid before trying something new? Then completely fallen in love?! Has anyone tried any new work-out classes that they absolutely love??? Now I want to try them all!! I am now tempted to try all the other classes that have interested me (Bar Method, a pole-dance class etc!). the power of yoga is amazing! Glad you finally tried it! I hate being the new person in class- so unsure of the routine and if you're doing it right, but once you get into the groove it's such an addiction! I definitely recommend Barre. I took in Dallas for a year and just recently joined a studio here that I really like (Barre Bee Fit)- if it's close to your work or home, I definitely recommend checking it out. 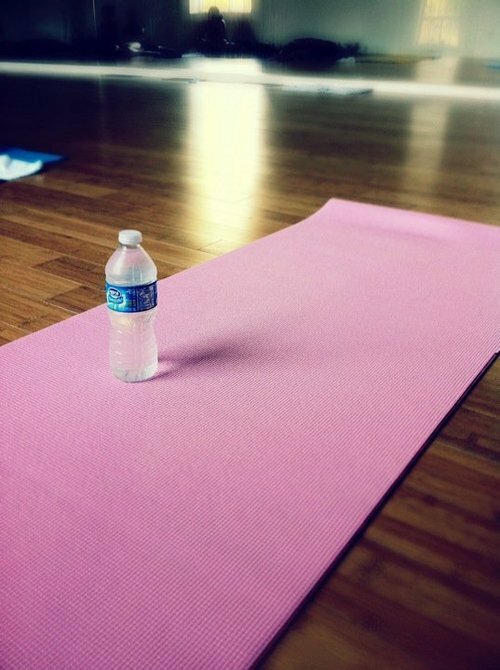 omg i have been wanting to try yoga all year (was a new years resolution) but have been kinda nervous to just do it. this might be the push i need! hope to see you thursday!! so glad that you are enjoying yoga. such a mind cleanse! love your blog and bags! I love yoga and just took my first budakon class (yoga and martial arts) and it was even more awesome then i could imagine! I am a fan of non-traditional workouts: I do belly dancing, boot camp and pole dancing. Barre class is next! It is something new and interesting that makes me work in different ways. Although, I don't recommend doing all of these things at once. You're body gets confused and starts working against itself. I love yoga, you wouldn't think it would be hard but oh boy it's tough. Have you tried spin??? I love spin I usually burn about 900 cal. in an hour, it's quite intense. I feel much better after though. I fell in love with yoga in college! I do it at home now, but I would love to get back into some group classes! I always have to push myself to go to a yoga class, but afterwards you really do feel amazing! I really want to try pole-dancing... I know that's weird, but I've heard it's an INSANE workout! I can TOTALLY relate, I had the same concerns about yoga but now I am completely addicted. It goes far beyond exercise and totally connects with your mind, body, and spirit - it is like a therapy session. The best! Next up, Bar Method. I felt the same way about Zumba and ended up loving it. I'm also looking forwar to taking my first Pure Barre class this weekend. Later this month I'll be trying a pole-dancing class too! I've just installed iStripper, and now I can watch the sexiest virtual strippers on my taskbar.